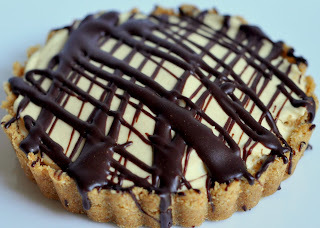 Peanut Butter Banana & Chocolate Pie. Or tart. Whatever you want to call it. 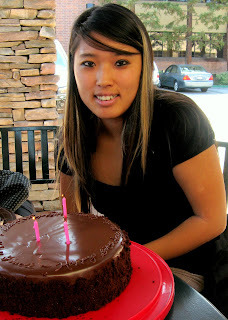 Last week I made Grace a Devil's Food Cake with Peanut Butter Mousse. It was.. ok. The cake was a Dorie Greenspan recipe from her, Baking: From my home to yours cookbook. Don't get me wrong, it was super rich and fudge-like, but I think I was expecting something different. The mousse was a chocolate mousse recipe I adapted by replacing melted chocolate with melted peanut butter. Didn't work as well as I was hoping. But it got a good response overall... minus one grumpus who may have been too preoccupied with his new phone and transferring all his contacts. Haha no, I kid. I welcome any and all critique. The birthday girl loved it so I guess that's all that matters. 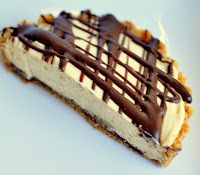 This Peanut Butter Mousse-like Tart was a creation largely out of the need to use up some of the ingredients left over from the Chocolate Cake I had made. 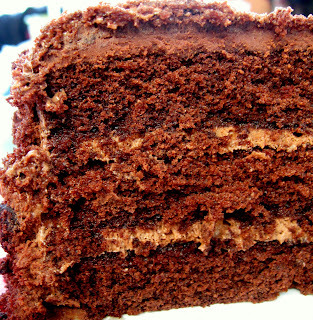 I had a bunch of Chocolate Ganache and the Peanut Butter that I didn't use all of. We also have all this Graham Crackers that my mom bought a while ago that keeps sitting in our kitchen. 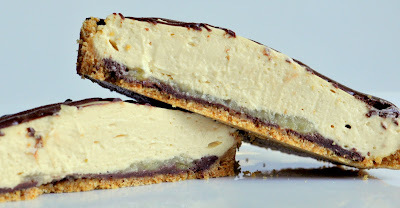 So... Graham Cracker Crust... with... a Peanut Mousse.. and Chocolate Ganache! The Banana was an homage to all of the PB&J with Banana sandwiches I had in Arizona. Yields ONE 9" round pan. I used 6 tart shells I had and had a lot left over. Combine all in a bowl and mix with hands making sure all the melted butter is incorporated into the dry crumbs. Press into baking recepticle FIRMLY. Otherwise it will fall apart when you try to unmold it. Bake in a 350 degree oven for about 15 minutes or until golden brown. It's already golden brown, you say? Well, bake it until it gets MORE brown. Let cool completely before building the tart. Combine in a microwave safe bowl and heat in 30 second intervals making sure to stir inbetween. In a small pot combine the sugar and butter and heat on medium high until it boils. In the meantime, cut the bananas into 1/4" cubes. Once the sugar and butter start boiling add the bananas and cook for about 5 minutes. Yields 2 cups. I think I really only needed about 1/2 this recipe. Heat milk in a medium pot. In a medium stainless steel bowl put the egg yolks in. In a separate bowl combine the sugar and cornstarch. With your hands mix together until there are no lumps in the cornstarch and the mixture is homogenized. With a whisk, slowly pour in the sugar and cornstarch mixture into the yolks. This will ensure that there are no lumps in your yolk mixture. Right before the milk is about to boil take it off the heat and slowly whisk into the yolk mixture. TRICK: Make a ring with a wet towel and place the bowl on top of it so it doesn't move around when you do this. Place the mixture back into the pot and on medium continue to whisk. Once it starts to thicken whisk vigorously for about 1-2 minutes. Take off the heat and transfer to another bowl. At this time slowly whisk in the butter. Then add about 5 oz of Peanut Butter. Add less or more depending on how strong of a peanut butter taste you want. Place bowl in an uce bath (another larger bowl with ice and some water in it) and continue to whisk until it cools completely. In a standing mixer with a whisk attchment whip the 1 1/2 cups of Heavy Cream until stiff peaks. Fold into the peanut butter pastry cream in thirds. 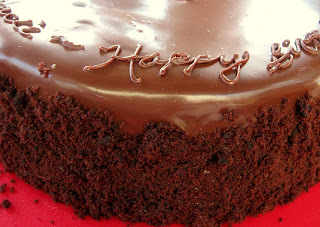 Without unmolding the Crust spread enough Ganache so that it covers the bottom. Spoon about 2 tablespoons of Banana on top of the Ganache. Spoon enough Peanut Butter Mousse to fill the tart. Take the Ganache and heat it up in the microwave for maybe about 15-20 seconds so that it becomes nice and fluid again. Then take a spoon and drizzle over the tops. Let it set up in the fridge for at least 30 minutes. If you're too impatient and don't care about the mess.. go ahead.. enjoy! "Oh Nads, why do you love me so much..?" Thank you!! I'm really trying to get better!